Inspired by my last roundup post I’ve decided to create a vegan green bean casserole from scratch. Ok, not totally from scratch – I admit that I’ve used frozen green beans as a little time saver. Read on also, if you want to use fresh legumes for this recipe, I’ve covered that too. I’ve been living in Europe for all my life, hence I’m not used to the traditional Thanksgiving side dish in the US. In consequence I love the idea to enjoy these legumes as a main course of a meal all year around. This delicious recipe is laid out for 2-3 persons. With a salad as starter it makes a skinny and easy dinner (or lunch) for all three of us. If you want to serve it as a healthy side dish, then it will make around six portions. 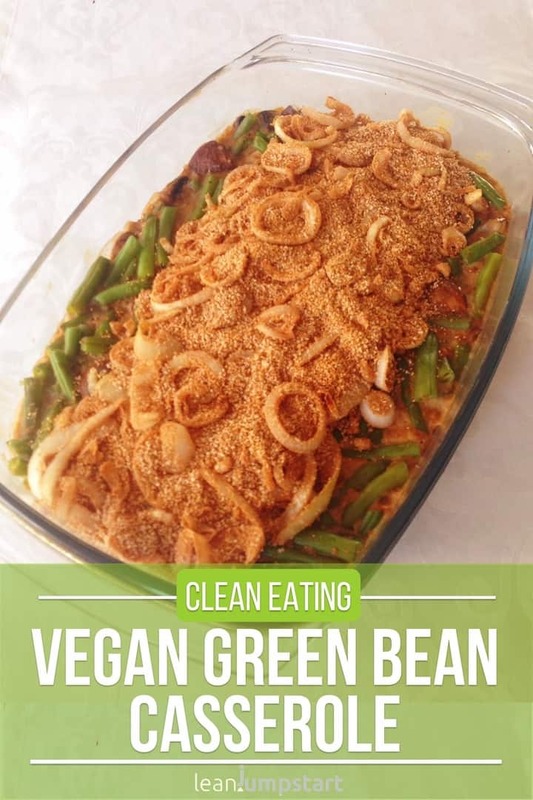 How to make green bean casserole vegan and clean? Since my daughter turned vegan over two years ago, I’ve had to come up with lots of plant-based recipes. Creating vegan clean eating recipes was and is sometimes a challenge, especially with the actual legume recipe. But over time you get used to it and also in this case I’ve found a workaround. I know that Campbell’s original recipe calls for legumes in cans which have a salty flavor at best and metallic at worst. Frozen green beans offer a convenient and healthier way to bake this delicious plant based meal independent from the season. You just take a big pot, fill it with a small amount of salted water and cook your frozen beans for about 3 minutes. They don’t have to be completely cooked yet. Plunge your legumes in a bowl with iced water to cool them quickly. This is an important step to get bright and crunchy beans. Do you have fresh beans at hand? You just need to remove ends and strings before cooking them 5 minutes in some boiling salted water. Again, you have to cool the vegetables quickly to keep the bright green color. use a soy cream (see picture above) and plant milk (e.g. almond milk), which is not clean. or, if you want a skinny, vegan and clean recipe, then the cauliflower puree is your best friend. For me it really depends, if I have cauliflower puree at hand or not. I’ve added some instructions how to make pureed cauliflower at the end of this blog post. But in the most cases I will practice my 80/20 approach to clean eating and will use a light soy cream for this recipe. At last you just add the legumes and pour the mixture into an oven safe baking dish. 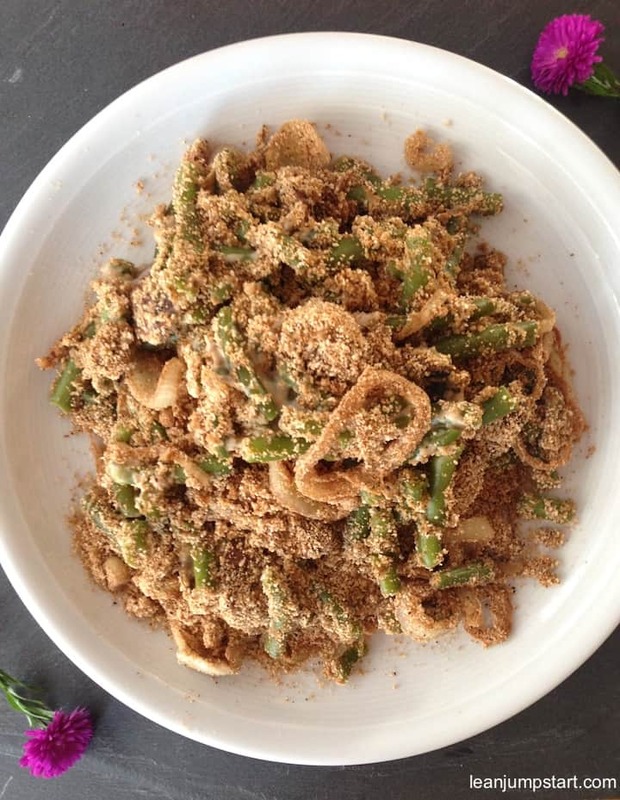 Most vegan green bean casserole recipes I’ve found on the web couldn’t live without the crunchy French-fried onions as topping. I suppose this has to do with their irresistibly crunchy texture similar to the addictive potato chips. Maybe a bit of Thanksgiving nostalgia plays a role too. Take a skillet without oil and roast your whole wheat bread crumbs carefully to prevent them from burning. Fill the roasted bread crumbs into a bowl and put aside. In the same pan you can now heat 1 tablespoon of olive oil and sauté garlic and onions. After 5 minutes add a dash of date syrup. Sauté for another 5 minutes and then add onions to the roasted bread crumbs, mixing well. 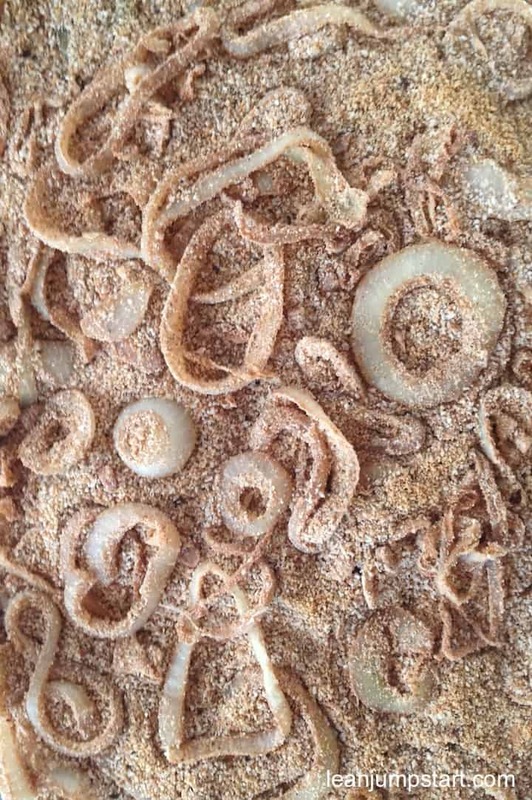 We love this kind of “whole wheat bread crumbs onion rings” topping. Ok, here is the full recipe for a homemade green bean casserole with frozen green beans. Take a big pot, fill it with some salted water and boil frozen beans at medium heat for about 3 minutes. To cool them quickly, plunge legumes in a bowl with iced water. Then transfer legumes into a bowl and put aside. 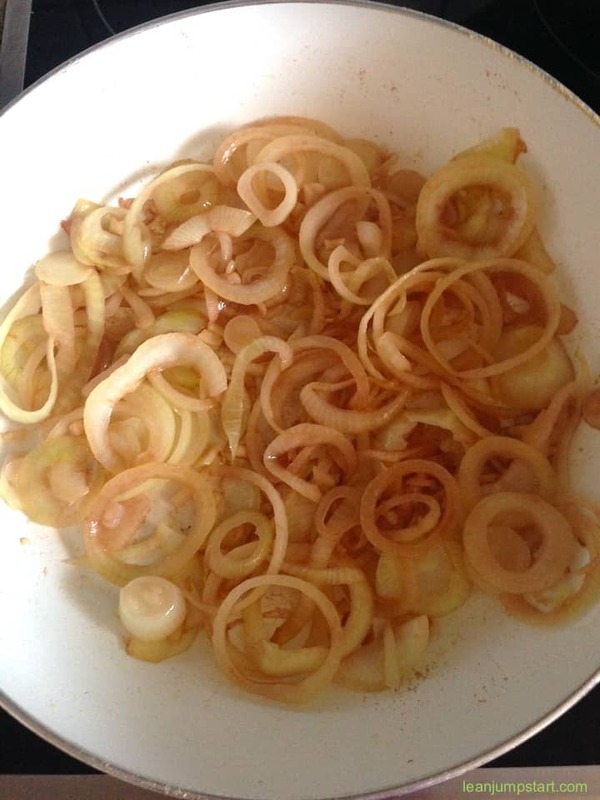 Heat 1 tablespoon of olive oil in a pan and sauté onions and garlic for 5 minutes. Add a dash of date syrup and let it cook for another 5 minutes. Then add sautéed vegetables to the bread crumbs and mix well. 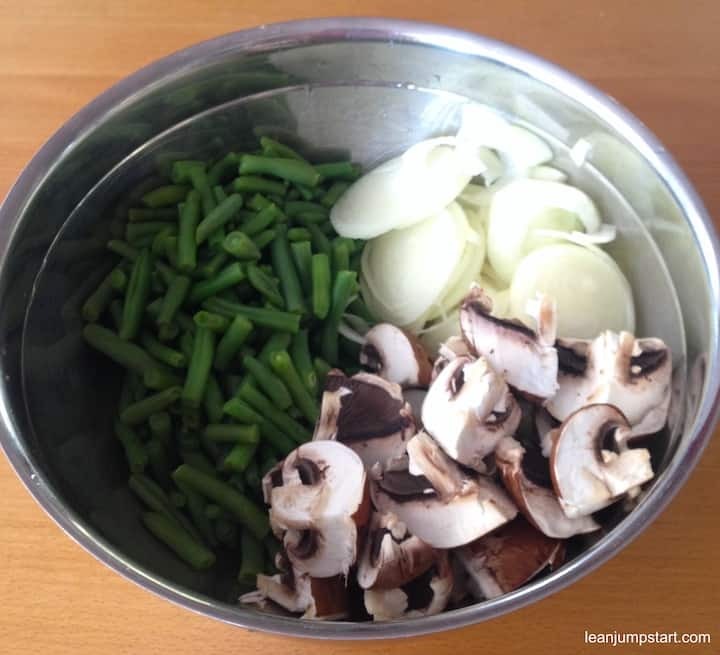 Use the pan again, heat another 1 tablespoon of olive oil and stir-fry mushroom quarters. After about 7-10 minutes sprinkle the mixture with 3 tablespoons of whole grain flour and let it fry for another minute. Add a large dash of (plant) milk and stir well to prevent lumps from forming. 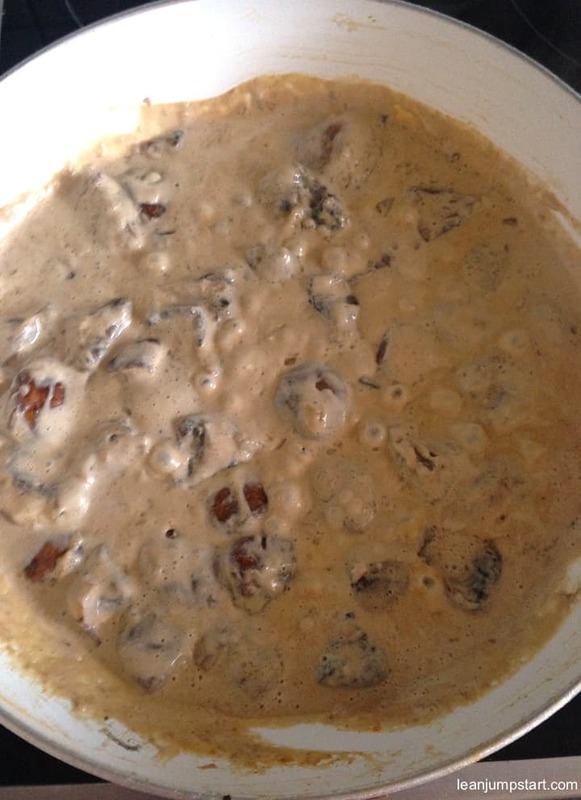 Then pour in the soy cream (or cauliflower puree) and continue stirring steadily to prevent clumping. Taste it with salt, pepper, nutmeg and paprika. 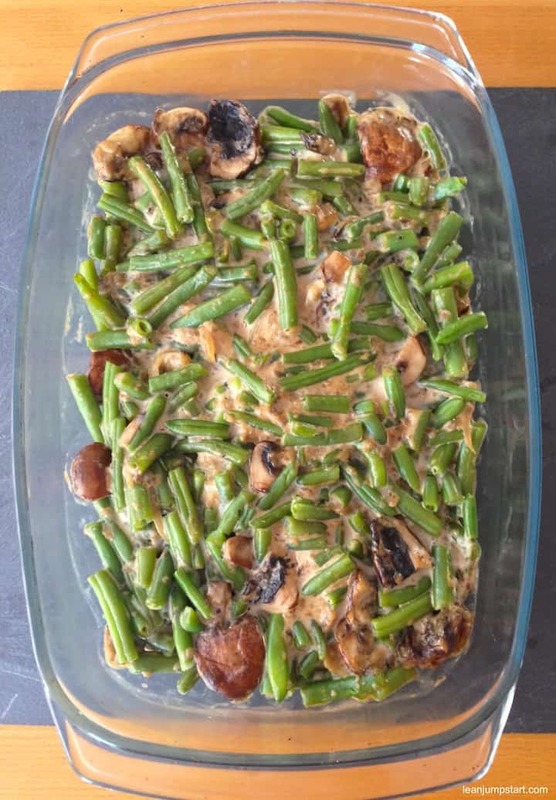 Combine the green beans with the creamy mushroom sauce and pour it in an ovenproof dish. Bake it in the oven for 15 minutes at 180 °C /360 °F. Then take out the dish briefly, sprinkle with the onion and bread crumbs mixture and bake the bean casserole for another 10 minutes. Instead of salt you can season your vegan dish also with some soy sauce. 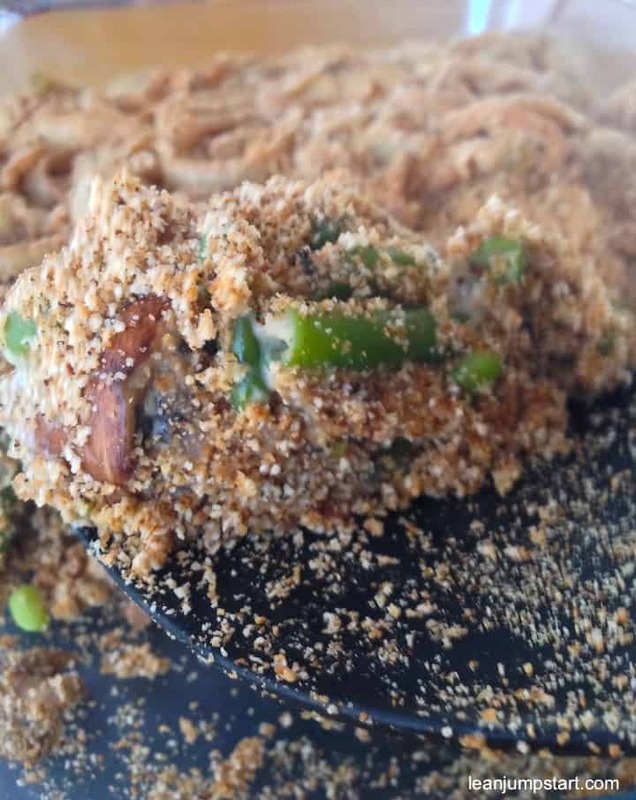 You can optionally replace part of the bread crumbs with nutritional yeast. You can even increase your fiber intake by using whole wheat panko bread crumbs which seem to be unbeatable as a crunchy topping for casseroles and baked foods. But please check the ingredient list as they are not always clean. Use a large pot and bring 4-quarts/3 liter of salted water or vegetable broth to a boil. Drain vegetables, reserving 1 cup cooking liquid. Process cauliflower and 2 tablespoons of liquid in a blender until smooth. Add more water until wished consistency is reached. Season with some salt and nutmeg. Need some more inspirations? Feel free to check out my roundup post with top 7 with fresh green bean casserole recipe ideas from my fellow blogger. I love the simplicity and healthy-ness of this. I was trying to think of something to bring to my family’s Thanksgiving dinner and I may have found it. Thanks! Hey Hannah, you are very welcome. I’m glad that my casserole recipe could inspire you to prepare a healthier dish to your family feast. Enjoy! Oh what an improvement over the green bean casseroles I saw on the THanksgiving table growing up! You’ve really made a lovely dish here, one I’d look for year round. No need to wait for Thanksgiving. That’s what I thought too Holly, when I created it. It’s just too good to wait until end of November but perfect to serve it year round. You are so right about using frozen beans. It makes a world of difference. I love the way you made the sauce instead of using canned. So fresh! Yes Leslie, this recipe is really worth to invest a little bit of time and use fresh ingredients. This does look tasty! Green bean casserole hasn’t made it into our Thanksgiving routine but perhaps it should! Thank you David. Yes you should, I can imagine that it would enrich your thanksgiving table in a healthful way. I love how you turned a holiday classic into a healthier option. This is the perfect recipe for the upcoming holiday season. Thank you Kelly, yes it’s great for the upcoming holiday season, but combined with a salad you could use it even weeknights throughout the year. I’m not vegan, but I love a good vegan green bean casserole and I make it every Thanksgiving! I love it that you used cauliflower in yours! 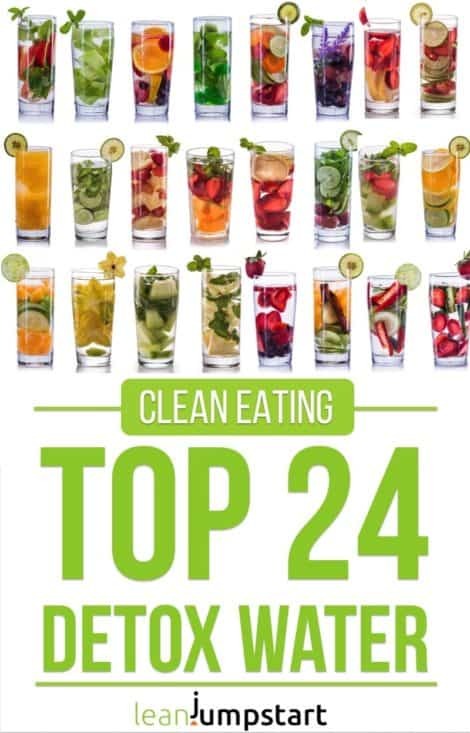 Just pinned…thanks for the healthy inspiration! You are very welcome, Traci. Thank you for pinning! Yes cauliflower puree is such an amazing replacement for any cream and works also perfectly for this recipe. I do love some green bean casserole during the holidays, but I know it’s loaded with fat! I love how you’ve thought of everything to turn this into a healthier option. Thank you Lisa. The fact that I could turn this dish into a lighter version with less fat is the reason why I will be happy to cook it regularly through out the year. Now, this recipe will be one of my favorites. Looks incredible! Just in time for Canadian Thanksgiving! 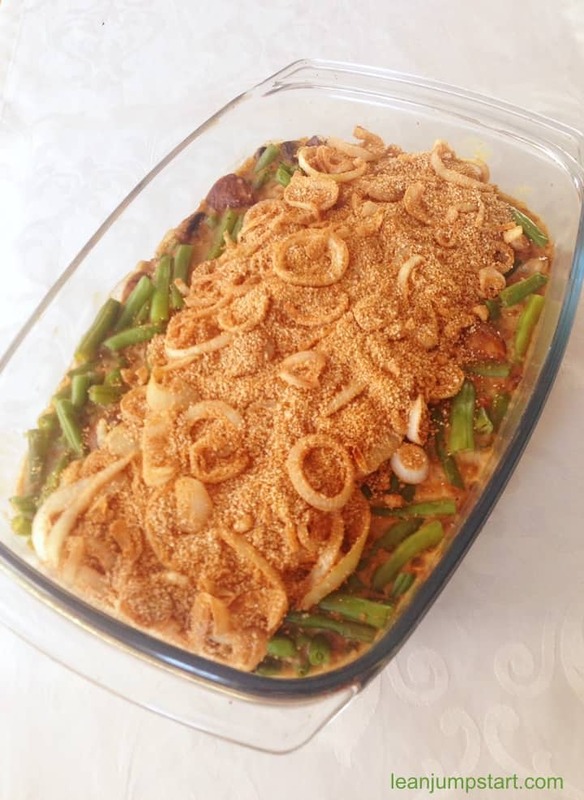 I always love green bean casserole around the holidays, and your version looks delicious. That crispy onion coating is perfection. Can’t wait to give this a try!